« Sydney Business Mentor Makes Headlines In Victoria! Published on January 12, 2011 in Business Coaching and Business Mentoring. 1 Comment Tags: Business Guru, Coaching, Guru, Mentoring, Motivational Speaker. That’s when I realise a lot of people don’t know the difference between what I am, a mentor versus a motivator. You depend on to keep you ‘up’. He/she becomes a psychological crutch you need to get ‘pumped up’. You’ve seen these people at ‘motivational seminars’. They’re the over-excited ones that act like the seminar speaker/leader/guru’s groupies . When the seminar ends, so does their excitement and ability to follow through. Who tells you what you WANT to hear, to get you excited, in a positive state. Sure this is fun, but it’s only temporary. Once the lies and self-deceptions stop, so does the warm fuzzy feeling. Who needs to push you to action. Pushing means effort and that means tactics need to be used to make that happen. Often, these are manipulative in nature which can leave you with a feeling of having been used and in some extreme situations, abused. Who trusts your abilities to rise to the occasion. Even though he/she is inspirational and aspirational, there is a calm submissive serenity to the mutual respect shown from mentor to protégé and vice-versa. Who tells you what you NEED to hear. This truthfulness is paramount for the relationship to foster long-term solutions. Often, this advice is hard to hear, but it’s necessary for breakthroughs to occur and self-imposed barriers to be removed without necessarily resorting to ‘interventions’. Who inspires confidence and pulls you along to become your best. 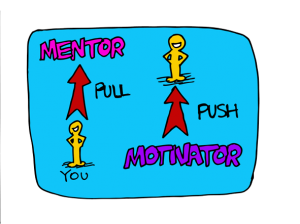 Without the constant pushing and prodding, a mentor can guide, assist and advise you along your self-propelled journey at your own pace with an empowered approach that feels natural. If you want guaranteed business results, contact us. I think I need a mentor rather than a motivator because I can be my own motivator. I can push myself forward and cheer myself up till the cows come home, but for all the wisdom and hard facts, I would rely on an outside source. I, for one, am glad you have taken on this role. This blog is great, and I feel very motivated AND mentored after stopping by.